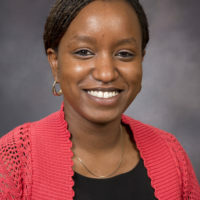 Dr. Christine Ngaruiya is a faculty member of the Section of Global Health and International Emergency Medicine in the Department of Emergency Medicine (DEM) at Yale University. Her research interests center on: Non- communicable Diseases, barriers to care, community-based interventions and ethics in clinical practice with a particular focus on Africa. Her past professional work has focused on health disparities amongst minority populations in the U.S. and Community-Based Participatory Research (CBPR). Some past honors include: the Emergency Medicine Resident’s Association (EMRA) Augustine D’Orta Award, Harambe Entrepreneur Alliance Associate and the 2014 Harambe Pfizer Fellow Award. She has held several national leadership positions including with: the American Medical Students’ Association (AMSA), the Emergency Medicine Residents’ Association (EMRA), the Society of Academic Emergency Medicine’s (SAEM) Global Emergency Medicine Academy and the Consortium of Universities for Global Health (CUGH)-Global Health Education Consortium (GHEC)-Canadian Society for International Health (CSIH) Trainee Conference and Advisory Committee. She is a member and regular contributor to the Young People’s Chronic Disease Network (YP-CDN) and the U.S. Investigators’ Global NCD Research Network Steering Committee. Additionally, she served on the Research Symposium Committee for the African Congress on Emergency Medicine in 2014. She matriculated with a Master of Science in Tropical Medicine and International Health, and Diploma in Tropical Medicine and Hygiene from the London School of Hygiene and Tropical Medicine in 2015. In addition to joining faculty in the DEM for the 2015 year, she was also selected as one of twenty Yale Public Voice Fellows for 2015-2016 from across campus.